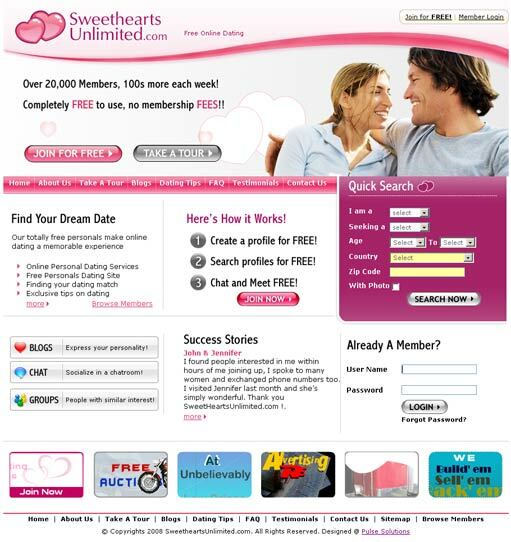 Sweetheartsunlimited.com is currently the only professionally designed dating / community website that’s COMPLETELY FREE to use. Mr. Roy Newsome, a long standing client awarded the contract to Pulse Solutions to redesign his dating website that already had 15000 members. With upto 500 unique visitors each day this was a success story waiting to happen. We designed the system from ground up to include the most popular features from Facebook and MySpace. The look is unique and the system unmatched in the experience it provides. The user base has increased by over 15% in the first month itself. Get yourself registered while its free !